It's been a while I've showed anything knitting related. Part of this is that I haven't knitted that much. 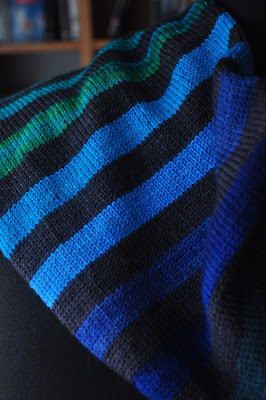 Another part is that I forgot to take pics of the socks I've knitted before xmas for presents. But here are two projects I have pics of. 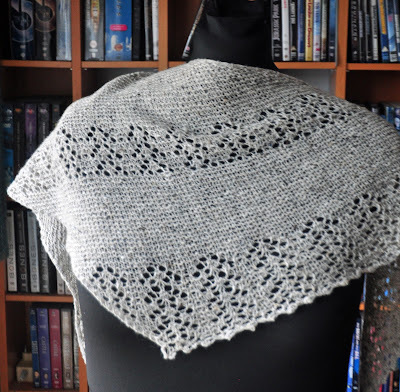 I bought the yarn I used in this shawl more than a year ago for a different project. And then totally forgot about it. I found it two weeks ago by chance and desided I'd like to make a smallish shawl, a quick little project just for fun. The pattern is called Nurmilintu (and is free) and I used Debbie Bliss Fine Donegal yarn for it. It was a fun little project, even if I had more problems than usual with the lacey bits (but nothing that a ton of stitch markers couldn't solve). I added two more lace repeats than the pattern called for in order to use up as much of the yarn as I could. With some extreme blocking if turned into a light, reasonable sized shawl. The other one is a longer term projects using some small amounts of different Wollmeise yarns. I'm using 8 differen blue/greens alternating every 8 rows with Maus alt. It has about a million ends to weave in, but other than that loads of fun. I'm almost done with that. My Christmas table runner is a bit on the late side. I had some problems with deciding on the binding, and, also, was quite busy with other stuff before Christmas. But, well, rumor has it, there's going to be another Christmas in 2018, so I just use it then. 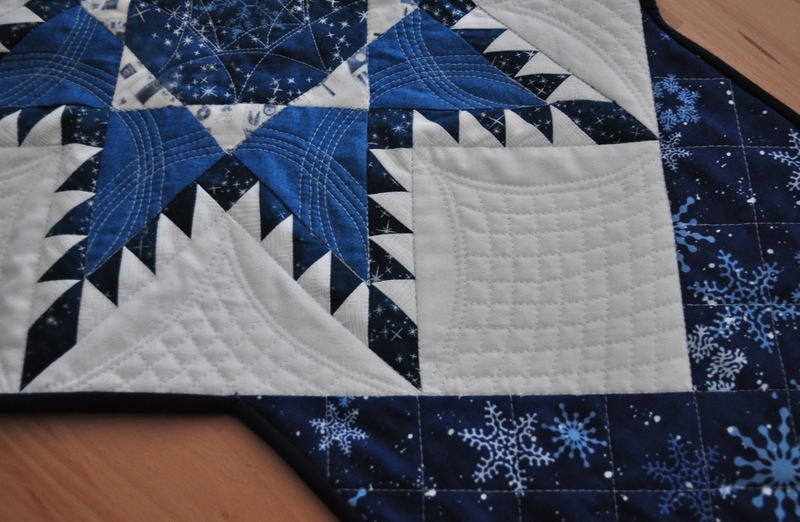 The center is the feathered star block I made in November, I just extended it on both sides with some christmas-y fabric to make a table runner out of it. 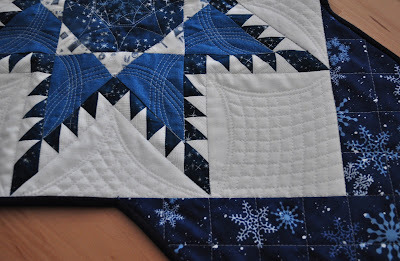 As I was late anyway (I finished it yesterday), I took my time with the quilting, playing around with curves and grids. I'm really happy on how it came out.